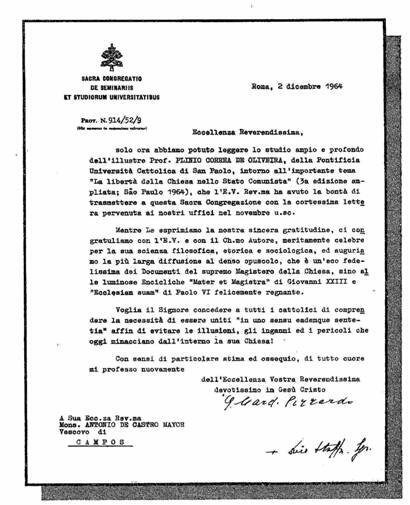 English translation of the text of the December 2, 1964 letter, in which Giuseppe Cardinal Pizzardo, Prefect of the Sacred Congregation for Seminaries and Universities, and Archbishop Dino Staffa (later made a Cardinal), the Congregation’s Secretary, thanked Most Rev. António de Castro Mayer, Bishop of Campos, Brazil, for sending them a copy of Prof. Plinio Corrêa de Oliveira’s book. The Freedom of the Church in the Communist State. This book was later published under the title The Church and the Communist State: the Impossible Coexistence. Only now were we able to read the ample and profound study by the illustrious Prof. Plinio Corrêa de Oliveira, of the Pontifical Catholic University of São Paulo, on the important theme, The Freedom of the Church in the Communist State (3rd enlarged edition, São Paulo, 1964), that Your Excellency kindly sent to this Sacred Congregation, along with your most kind letter that reached our offices last November. 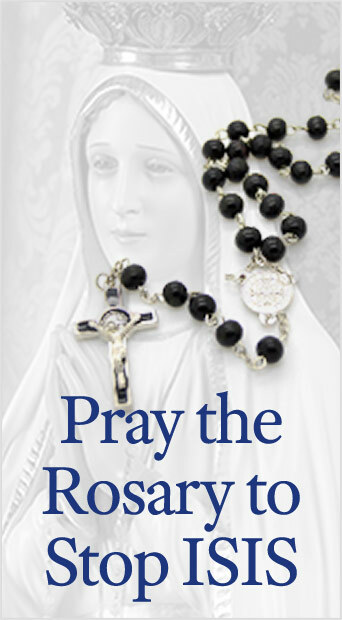 While expressing our sincere gratitude, we congratulate Your Excellency and the eminent author, deservedly famous for his philosophical, historical and sociological work and augur the greatest possible dissemination for this substantial booklet, which is a most faithful echo of the Documents of the supreme Magisterium of the Church, including the luminous Encyclicals, Mater et Magistra of John XXIII and Ecclesiam Suam of Paul VI, happily reigning. May the Lord grant that all Catholics understand the need to be united “in uno sensu eademque sententia” to avoid the illusions, misunderstandings and dangers threatening His Church from the inside! This entry was posted in Statements by TFP.org. Bookmark the permalink.